Magnetic Stripe Encoder card readers and writers are utilized by corporations and financial institutions to store data and serve as access control for authorized access to doors or computers. ArcadiaID offers magnetic stripe encoder cards as an option when purchasing ID card supplies. In order to fully utilize the magnetic stripe feature on an ID card, it is necessary to purchase a Magnetic Stripe Encoder and Magnetic Stripe Reader which makes a nice addition to ID card kits. The EasyIDea™ magnetic stripe encoder can be used to Read, Write, Erase, Copy, and Rewrite all HiCo and LoCo Magnetic Stripes. The EasyIDea™ Magnetic Stripe Encoder includes free full version encoding software. The EasyIDea™ Magnetic Stripe Encoder is compatible with ALL MSR206 software and will work seamlessly as a quality, cost-effective MSR206 replacement. 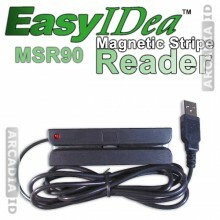 The EasyIDea™ MAGNETIC STRIPE READER provides a simple, reliable, and versatile magnetic stripe reading solution for all data management needs. A Magnetic Stripe Reader is perfect for applications such as point of sale, access control, and self-service applications. No programming, software drivers, or external power is required. The reader is universally compatible with all third party software. The reader is small and light weight and can be affixed to most computer keyboards or to any flat surface. When combining with either an id hologram and or butterfly pouch laminating kits from ArcadiaID,the authenticity of your ID is greatly improved.